With a consistent sound despite changing dynamics, The Plot in You brings us their third studio album in the past five years. Well-received with fans and newcomers alike, Happiness In Self Destruction, chronicles maturity and artistic development—along with nasty breakdowns and killer instrumentals. The first impression of Happiness In Self Destruction is an eerie one. The first three tracks have a certain discord; something just doesn’t sound quite right. Rather than creating something unpleasant, however, this element furthers the emotional impact of those tracks. That impact is perhaps the most evolved portion of the band’s sound. Gone are the days of blind rage and angst of First Born as Happiness in Self Destruction ushers in a new era of growth. The same intent is put behind the album; it’s just channeled into a new direction that reads with more depth. “Better Vibes” and “Happiness in Self Destruction” are outstanding examples of this evolution. Powerful lyrics coupled with frontman Landon Tewers’ piercing vocals raises goose bumps, and likely fists into the air. The whole album gives off a fierce sense of emotional rawness. Guts were really spilled in both the songwriting and recording processes. It’s often difficult for bands– especially those going for intensity– to find a dynamic that works for them, but such is not the case with The Plot in You. They’ve managed to find a really nice ratio of vocals to instrumentals, so both aspects work together to hit home the energy they’re going for. 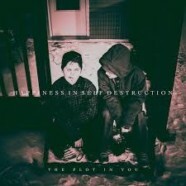 Lyrically, Happiness is in Self Destruction is a modern day masterpiece. Despite the ferocity in their execution, the lyrics are straight poetry. Their vulnerability, contrasted with the strength of the instrumentals, produces this beautiful cathartic effect that leaves you wanting to press replay. With relatable, powerful messages, it’s no wonder The Plot in You has been moving up in the industry. The shift in tone could simply be a reflection of a shift in the entire genre to one that appreciates more craft in performances, or perhaps just personal evolution of the members themselves. Wherever this direction is coming from, it’s definitely a great track looking forward for these guys.